1K. Zhang is with the State Key Laboratory of Advanced Optical Communications Systems and Networks, Shanghai Jiao Tong University, Shanghai, China. He is also with the Department of Electrical and Computer Engineering, McGill University, Montreal, Québec H3A 2A7, Canada. 2Q. Zhuge (e-mail: qunbi.zhuge@mcgill.ca) is with Ciena Corp., Ottawa, Ontario K2H 8E9, Canada. He is also with the Department of Electrical and Computer Engineering, McGill University, Montreal, Québec H3A 2A7, Canada. 3H. Xin, H. He, and W. Hu are with the State Key Laboratory of Advanced Optical Communications Systems and Networks, Shanghai Jiao Tong University, Shanghai, China. 4D. V. Plant is with the Department of Electrical and Computer Engineering, McGill University, Montreal, Québec H3A 2A7, Canada. The explosion of mobile traffic requires fronthaul networks to provide huge data capacity. One straightforward solution is to use wavelength division multiplexing (WDM) technologies with a sufficient number of transceivers, but the massive deployment of fronthaul networks inevitably adds transceiver cost. 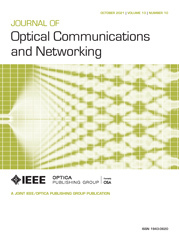 In this paper, we propose and demonstrate a low-cost scheme using a partitioned asymmetric arrayed waveguide grating router (AWGR) and distributed feedback Bragg (DFB) directly modulated lasers (DMLs) for WDM fronthaul. First, the centralization feature of a cloud radio access network (C-RAN) puts the transceivers together by nature, offering the potential to reduce the number of deployed transceivers based on optical switching fabric. We design what we believe is a novel asymmetric N×M AWGR-based switching fabric featuring a “partitioned cyclic routing” property that (i) enables flexible contention-free transceiver assignment; (ii) relaxes the requirement of tuning range, which allows the use of DFB lasers with moderate tuning range; and (iii) changes the diversity of the tuning range from N types to N/M types. We also investigate the scalability of the scheme and show its rearrangeable contention-free assignment feature. Second, to adopt cost-effective DMLs, the intrinsic Gaussian-shape AWGR’s edge filtering is employed to manage the frequency chirp of DFB DMLs, avoiding additional optical or electrical processing modules. Experiments are conducted to demonstrate the robustness of this scheme. In particular, we report that the allowable optical signal’s frequency deviation ranges from −7.5 GHz to 7 GHz, and the induced additional crosstalk to AWGR’s adjacent port due to a deliberate frequency offset is far below the system design limit. In addition, the scheme is compatible with common 50 GHz, 100 GHz, and 200 GHz channel spacing AWGRs. a When Mi is serving a cell site, we mean that a transceiver in Mi is assigned to the cell site.